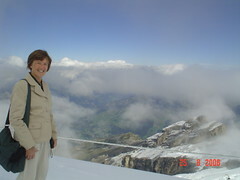 Sunshine in the snow above the clouds on our third full day in Switzerland. I was hoping you could click on the image and go to more from the day but the imaging service wants me to pay for the facility. But if you click you will se more from the day on the site. This photo is at above 7000 above sea level. Cloud kept coming and going obscuring the view but I will post one more from one of the three cable cars on the ascent.